You’ve certainly heard about the most famous diamonds of the world like the Hope Diamond, the Koh-i-Noor or the Cullinan diamond. But do you know from which diamonds mines they are coming from? Read this post to learn about it. The Cullinan Diamond Mine, previously known as the Premier Mine (renamed in late 2003), is an underground mine located in today’s Gauteng Province of South Africa, in the eponymous town of Cullinan (both the mine and the town were named after Thomas Cullinan, a diamond magnate of South African origin). Much as the new name would imply, this is the mine that yielded the largest rough stone in the world to date – the 3,106.75-carat Cullinan (unearthed in 1905, only three years after the mine’s establishment). Cullinan I and Cullinan II are the most prominent cut stones in the Crown Jewels of the UK. Other notable diamonds mined in the Premier Mine include the Premier Rose (353.9-carat rough stone cut to a pear-shaped 137.02-carat colourless diamond), the heart-shaped Centenary Diamond (weighing in at 273.85 carats), the Golden Jubilee Diamond (at 545.67 carats, this is the largest cut stone in the world, having taken the title from the Cullinan I in 1985), the Niarchos Diamond (originally a 426.5-carat internally flawless stone, cut into several pieces), as well as the famed Taylor-Burton Diamond (a “mere” 68-carat pear-shaped stone, originally unearthed in 1966 as a 241-carat rough stone). Other notable diamonds include the Deepdene, Heart of Eternity, as well as the Allnatt Diamond (in all likelihood, though the last one is debated). The mine is considered one of, if not the most important sources of blue diamonds, extracting its stones from a kimberlite pipe. On that note, it’s important to stress that over a quarter of the world’s diamonds larger than 400 carats originate from here. Today, the mine is owned and operated by Petra Diamonds, who acquired it from De Beers in November 2007. Want to learn more about this mine? The Kollur Mine boasts of being the place of origin of some of the best known diamonds in the world. The list includes stones such as the somewhat mysterious Hope Diamond (widely believed to be the largest portion of the Tavernier Blue), the Orlov Diamond (also spelled Orloff, not to be confused with the Black Orlov), the Tereshchenko diamond, the Dresden Green, the Regent, the Great Mogul and Nizam diamond, as well as the Shah and Akbar Shah diamonds. Of course, it would be remiss of us not to mention some of the prominent pieces of the Crown Jewels of the UK and Iran – the poetically named Koh-i-Noor (Sea of Light) and Daria-i-Noor (Mountain of Light), respectively. The mine is a part of the famous Golconda family of mines, and arguably its most famous mine. It is considered to have been one of the most prolific diamond mines in its heyday. The mine sits along the River Krishna, on its south bank where it passes through the state of Andhra Pradesh. No one mines it today, but during the two-odd centuries (mid-16th to mid-19th century) it operated under the auspices of the Golconda Sultanate, the mine produced the already mentioned historic stones, as well as some lesser known ones (though the connoisseurs will surely recognize each and all), such as the Wittelsbach diamond, the Great Table Diamond (re-cut, with the Noor-ul-Ain or the Light of the Eye being the best known remaining piece), the Florentine diamond, as well as the Sancy diamond (which is not to be confused with the Beau Sancy). South Africa is the first place where diamonds were found at their original volcanic source, and of the myriad mines in the country, none is better known to the general public than Kimberley. What’s more, the very term for a type of igneous rock that is likely to contain diamonds – kimberlite, comes from the name of this mining centre. The early diamond rush in South Africa saw the Kimberley Diamond Mines at its very heart, which made them integral to the country’s early economic development. As of January 2016, all of the Kimberley Mines belong to Petra Diamonds, which encompasses the Dutoitspan Mine, the Wesselton Mine, the Bultfontein Mine and the Koffiefontein Mine. The Dutoitspan Mine opened as early as 1869, and is still in operation. It is known for its yellow-tinted stones, two of the best known being the Oppenheimer Diamond and the Golden Eye Diamond (potentially). The Bultfontein is as old as the Dutoitspan, though not as famed, while the Wesselton Mine is the youngest and, as of yet, the least known. That said, the Wesselton kimberlite pipe is positively the largest of the three. As for the Koffiefontein, it’s known for yielding diamonds of the first water, though no big names are associated with it. In addition to its contribution in South Africa’s economy and history, as well as geology, the Kimberley Mines also contributed to the naming of the KPCS, or the Kimberley Process Certification Scheme. This is a global certification scheme process with the intended goal of preventing the so-called “conflict” diamonds from entering the market. The impetus for this came from the desire to deny the finances to such movements as seek to overthrow legitimate governments recognised by the UN. Painting with a broad brush, the process involves a three-step approach – the participant-countries must ensure that no diamond that originates from the country finances any rebel groups, that no diamond is without the certificate and that no diamond is exported into or imported from a country that is not a member of the Kimberley Process scheme. This way, the scheme restricts revenues to only those sources that are approved by the respective governments, though the effectiveness of the process is brought into question by some entities. The Golconda mines are of great historic importance not only to gemmologists and gem enthusiasts, but also career historians. These alluvial mines are located in what used to be the Golconda Sultanate – both the mines and the Sultanate deriving their names from the Golconda citadel (the name is variously translated as Shepherds Hill or the Round Hill). Some estimates (based on the trade in the region) say that the region yielded a grand total of around twelve million carats. It’s also interesting to note that Golconda and India in the wider sense held the only known diamond mines in the world at the time (up to the mid-19th century). Probably the best known site was the Kollur Mine located in today’s Andhra Pradesh, which yielded such stones as (from the largest to the smallest) the Nizam Diamond, the Orlov Diamond, the Great Mogul Diamond, Daria-i-Noor (and the smaller Noor-ul-Ain, both cut from the larger Great Table Diamond), the Regent (aka the Pitt Diamond), the Tavernier Blue (later cut to yield the Hope Diamond), the Dresden Green Diamond, as well as a number of lesser stones. Another notable location was the Amaragiri mine, which yielded the Nassak Diamond, while other mines include Banganapally, Gollapally, Mallavally, Paritala, Ramallakota and Vajrakarur. On a similar note, there are diamonds whose exact origin is not established, though they are widely accepted to originate from the region. These include the Wittelsbach-Graff, the Sancy Diamond (probably Kollur), the Archduke Joseph, the Dresden White, the French Blue, the Pigot Diamond, the Polar Star, the Princie Diamond, the Shah Diamond, the Tereschenko Blue, as well as many others. The Letseng Diamond Mine (also spelled Letšeng or Lets’eng) is located in the Kingdom of Lesotho, a landlocked country entirely surrounded by South Africa, bordering the diamond-rich Free State to its north and east. It should then come as no surprise that the kingdom has considerable Kimberlite bodies in its northern part. In more specific terms, the Letseng mine is located in the Maluti Mountains, and has the honour of being the highest elevation diamond mine in the world. Such extreme elevation causes the temperatures in the mine to drop as low as -20 degrees Celsius, which poses rather unique challenges to the engineers and miners at Letseng. The ownership of the mine is shared between the Government of Lesotho and Gem Diamonds, with the latter being the majority shareholder. The mine operated from 1977 to 1982 under the auspices of the De Beers company, and then again from 2004 to 2006, when Gem Diamonds acquired 70 per cent of the shares. The mine recovers diamonds from a couple of kimberlite pipes – named Main and Satellite, respectively. The ore quality is exceedingly low, yielding no more than 2 carats per 100 tonnes of ore processed, although the quality of the diamonds and frequency of large finds more than make up for it. Some of the more significant stones include the Lesotho Brown (a considerable 601-carat brown diamond, found purely by accident in 1967) and the Lesotho Promise (recovered in 2006, weighing in at a substantial 603 carats, of exceptional colour band). The discovery of the Jagersfontein Diamond Mine (1869/1870) coincided with that of the Bultfontein and Dutoitspan. The Jagersfontein is what the geologists and gemmologists call a Kimberlite pipe, and one rich in stones sporting a singular gentle bluish tint. It is interesting to note that the tint is so unique it actually gave rise to the term “Jagers”, which is used among the experts and amateurs alike to refer to it. The locale originally held the eponymous Jagersfontein farm, and it was the farm overseer, one JJ de Klerk, who changed everything. As the story goes, De Klerk stumbled upon a few garnets while surveying the property in 1870, later learning that the prospectors working the Vaal river valley considered garnets to indicate the existence of diamonds in the vicinity. Consequently, he heavily invested on prospecting the area, which soon proved to be an excellent move as he unearthed a considerable 50-carat stone of bluish-white hue. De Beers only acquired rights to the mine in 1930, and sold it to the Superkolong Consortium (under the auspices of Batla Minerals), along all of its other assets, in 2010. Today, the Jagersfontein mine is all but completely abandoned, having operated on and off for almost a century. In the intervening time, it yielded two of the ten largest diamonds – the Excelsior (mined in 1893, and for 12 years the largest diamond in the world) and the Jubilee (originally named the Reitz in 1895). Other notable diamonds include the Earth Star, the Jacob Diamond, as well as the Cross of Asia. Interestingly enough, the Jagersfontein has the honour of being the deepest man-made excavation, rather than Kimberley’s Big Hole, and is a moderately popular tourist destination in the Free State province of South Africa. The Karowe Mine (also known previously as simply the AK6) is located in Botswana and operated under the auspices of Lucara Diamond Corp. Prior to 2010, the company owned 40 per cent share of the mine. In 2010, Lucara acquired African Diamonds, which effectively gave the company 100 share in the Karowe Mine. As for the mine itself, it is situated near Letlhakane (near Orapa, which is considered to be the diamond capital of Botswana). As one would expect, Karowe is hardly the only diamond mine in the area. Letlhakane is positively surrounded by mines – the Orapa Mine is to the northwest, the Damtshaa Mine to the north, and the Letlhakane Mine to the southeast, not to forget the Karowe Mine which is due southwest. Out of the four mines, only Karowe is owned by Lucara, through its subsidiary Boteti Mining (the rest are jointly run by De Beers and the government of Botswana). The mine recovers its stones from the AK6 Kimberlite pipe which has yielded in excess of 1 million carats since its inception in 2014. Like most diamond mines in the area, this is an open pit mine, with probable reserves estimated at around 6.2 million carats. The diamonds mined here are largely of high quality, with some exceptional stones. This includes the second-largest gem-quality diamond in the world – Lesedi La Rona (recovered in late 2015), second only to the Cullinan Diamond. This is excluding non-gem quality stones, in which case it’s only the third largest, after the Cullinan and the Carbonado do Sergio. Crater of Diamonds State Park is quite unique in that it’s the only diamond-bearing locality that is open to public. It’s also interesting to note that it was the first place (barring South Africa, of course) where people discovered diamonds right at their source. This had a profound influence on the State of Arkansas, so much so that the official flag bears a white lozenge, i.e. a diamond, to honour the fact. Moreover, the Official State Quarter issued in 2003 also bears a cut diamond in a prominent spot. The history of the mine and the park starts in 1906, when one John Huddleston of Murfeesboro chanced upon a couple of odd white crystals while surveying his farm. This triggered a diamond rush that, in turn, purportedly led to raising an entire tent city near Murfeesboro, named Kimberly. Huddlestone sold the farm to investors from Little Rock, who found that commercial mining was not entirely viable. The turning point came in 1952, when Howard A. Millar launched the attraction he named Crater of Diamonds, and followed it with a vigorous advertising campaign. The payoff came in 1956, when a visitor stumbled upon the Star of Arkansas. In March 1972, the State of Arkansas bought around 900 acres of land from the then-owner GF Industries, creating Crater of Diamonds State Park. Millar’s tourist attraction continued to be the centrepiece of the park. Since the establishment, diggers and visitors have found more than 29,000 diamonds, with some of the best known stones being the Uncle Sam (1924), Amarillo Starlight (1975), Strawn-Wagner (1990) and Esperanza (2015). The Argyle Diamond mine sits pretty in the northwest of Australia, in the region of East Kimberley, close to the eponymous lake. It is owned by Rio Tinto, which is a British-Australian multinational operating many two other diamond mines – the Diavik (Canada) and the Murowa (Zimbabwe), through their respective subsidiaries. The mine sources its diamonds from a lamproite pipe, which is a volcanic pipe akin to the more familiar kimberlite type (ironic, given the name of the region in which the mine is located). That said, the economic viability of lamproite pipes is still being evaluated, and the Argyle mine remains the only such source that is actually viable (another famous example is Crater of Diamonds State Park, though commercial mining there did not bring profit to anyone involved). The mine produces a large volume of diamonds (fourth largest), with the production averaging 8 million carats per year. The diamonds themselves are of average to low grade, with the majority of their gem-quality stones being brown diamonds. Given the fact that the demand for this tone is rather low, most of the mine’s income is from selling pink and red stones. That said, the company has had moderate success raising the popularity of brown diamonds by marketing them as cognac and/or champagne toned. As for the reds and pinks, Argyle remains the most reliable source of these tones and the single most prolific supplier, with nine out of ten stones coming from here. A noted example of such diamond is the Argyle Pink Jubilee. The MIBA Diamond Mine is, reportedly, the most massive diamond-bearing site in the world, with an estimated 300 million carats of deposits, allowing for an unprecedented economic viability. Admittedly, the estimates date from the 1950s, and there are scant recent studies either proving or disproving them. What is certain, however, is that the mine yielded the aptly named Incomparable Diamond. Located in the Democratic Republic of Congo (DRC), the mine is currently owned by MIBA, or Societé Minière de Bakwanga. Originally established in 1919 as La Societé Minière du Baceka, at the time when the DRC was a Belgian colony, the company is today jointly owned by Mwana Africa plc. (through Sibeka) and the Congolese Government. The shareholder holds the majority of shares (80 per cent), with the former entity actually running the operations in the mine. The mine is a source of great controversy for the DRC, given its enormous economic potential and the influence it exerts on the country’s finances. The workers have often gone on strike, chiefly demanding the payment of salaries they are owed. Consequently, the production has greatly fluctuated in recent years, and some experts claim it would take a significant amount of time and money to get the mine back on track. The site is also notorious for armed altercations between groups of illegal diggers and guards (one such incident in 2006 claimed six lives). Rumours of corruption among the highest officials in the country abound, especially in relation to the President Joseph Kabila, and the puzzling denial of a sizable find in 2017 does not help, either. The Williamson Diamond Mine came to prominence as the first diamond mine of any significance that is not located in South Africa. The mine also goes by the Mwadui Mine and is situated in the north-western part of Tanzania, some 23 kilometres from Shinyanga. It has been in operation continuously since 1940, when it was established by Dr. John Williamson, (hence the name). Interestingly enough, the other name for the mine – Mwadui, is also related to Doctor Williamson. Namely, upon discovering the site, he named it Mwadui, in honour of a local chief. These days, the two names are, for all intents and purposes, synonymous, at least in the diamond mining community. As noted earlier, the Williamson Diamond Mine is one of the longest-running open pit mines in the world that has been in continuous operation, with well beyond 19 million carats to its tally. The mine had been owned by the Williamson family before being sold to De Beers/Government of the then colonial Tanganyika in 1958. In 1971, the Government nationalized the assets, but was not able to keep it afloat. By 1994, Tanzania invited the company to buy back into the mine, which De Beers did, subsequently selling its 75 per cent of the shares to Petra Diamonds. It recovers its stones from a kimberlite intrusion. These days, the ore is of a low quality, averaging 6 carats per 100 tons, having dramatically decreased from the 1940–1965 average (about 30 carats per 100 tons). The most noteworthy stone recovered from the mine is the 54.5-carat Williamson Pink. The Diminco Mine is located in the town of Sefadu, also known as Koidu, in Sierra Leone’s Kono District. As one would presume, said district is rather rich in diamonds, with its capital (and the location of the Diminco Mine itself) being also the diamond capital of the country. Sierra Leone itself is among the top ten countries when it comes to diamond production, with a considerable percentage of the country’s export being diamonds. Currently, the mine is owned and operated by the eponymous Diminco, or, rather – DIMINCO (Diamond Mining Company). The mine recovers its stones from an alluvial deposit (specifically, the alluvium of the Woylie River) rather than a kimberlitic pipe, with the quality of the site being considered fair to middling on a worldwide scale. Of notable stones, the 620-carat rough Sefadu Diamond is worth a mention (as of yet, the world’s largest uncut stone). There is also the famed Star of Sierra Leone, the largest stone recovered from an alluvial deposit, as well as the fourth largest diamond of gem quality. Speaking of diamond mining in Sierra Leone, one cannot but mention its economic importance and the instability it brought to the region, especially considering the all-too-recent civil war that ravaged the country. Sierra Leone has done much to rebuild the reputation of its diamonds, and the Diminco mine is indeed a member of the Kimberley Process, but the process (no pun intended) is likely to last for a while. On a similar note, there is also the issue of the living conditions around the various mines in the country. The Mirny Diamond Mine is one of the largest manmade holes in the world, second only to the Bingham Canyon Mine, which mines copper. In other words, the Mirny (aka Mir) mine is the largest open pit diamond mine in the world. On that note, although the open-pit mining activity has completely ceased in 2001, and then reopen again as an underground mine. As of yet, the mine is still in operation underground, having produced about 1.5 million carats since the start of the activities. The sheer dimensions of the pit are staggering – 525 metres deep and 1,250 metres across, the mine is truly a sight to behold. The site is located in Russia’s Sakha Republic (Yakutia), in the eponymous town of Mirny, 4,170 kilometres east of Moscow. The name means “Peace” in Russian, and it stems from a radiogram that the geologists surveying the area sent to the headquarters upon discovery. To foil any potential spies, the geologists encrypted the message, which roughly translates: “We smoked the pipe of peace, the tobacco is excellent”. The leader of the expedition, Yuri Khabardin, received the Lenin Prize for the achievement. The mine recovers its diamonds from a kimberlite pipe (hence the wordplay in the radiogram message), with a large portion of stones being of gem-quality. Some notable examples include the famed (and long-windedly named) 26th Congress of the Communist Party of the Soviet Union Diamond. The weather extremes in Siberia make the extraction difficult even today, but during the first years, it was nigh impossible. Interestingly enough, engineers even used jet engines to melt the permafrost, switching over to explosives subsequently. Hailing from the home the country with the oldest tradition in diamond mining, the Panna Diamond Mine (also known as the Majhgawan Mine) is India’s largest diamond mine, as well as the only operational diamond mine in Asia outside Siberia. The site is a group of deposits that stretch over a considerable area rather than a single deposit, extending some 150 kilometres in a north-easterly direction on an arm of the Vindhya mountain range. There are a number of open pits dug down to an average of 10 metres in depth, with the combined area not exceeding 20 hectares. The reason for this is that the deposits lie in a rather thin layer over a large surface. The Panna Mine (or mines) sources its diamonds from a lamproitic rather than kimberlitic pipe, much like the better-known Argyle Diamond Mine in Australia. Although the area had been known as diamond-rich since at least the latter quarter of the 18th century, it has never gained much recognition. According to some sources, diamond merchants and travellers who visited the area (notably, the Jesuit missionary Joseph Tieffenthaler) stated that the diamonds mined here could not compare in quality to those from other mines in India, such as the Golconda Mines. There are no notable diamonds sourced from here, though there is a classification table for those that are. According to this, all stones mined in Panna can be divided into four categories – Motichul (clear stones), Manik (slight orange-reddish tint), Panna (blue-greenish hue) and Bunsput (with a slight reddish-brown colouration). The Finsch Diamond Mine is one of several mines across Africa owned and run by Petra Diamonds (other notable sites include the Cullinan Mine, previously known as the Premiere Mine, the Koffiefontein Mine, as well as the Williamson Mine). The Finsch Mine itself is located due northwest from Kimberley, some 160 kilometres away, near the town of Lime Acres. Interestingly enough, the economy of the town itself revolves around mining, especially of limestone deposits (hence the name). The Finsch mine is very much akin to the other mines owned by Petra Diamonds (and De Beers prior to the transfer of ownership that took place in 2011) in that it recovers its stones from a diamantiferous kimberlitic intrusion. The total extent of the pipe is just shy of 18 hectares, and estimates from 2015 claim there is enough ore to keep the mine operational for at least two decades. It is interesting to note that the mine was originally an open-pit type of operation. It was discovered purely by accident in 1961, while the area was being surveyed for asbestos deposits. Such state of affairs lasted for three decades, when the mining process was completely transplanted underground. The moving of workings wasn’t an abrupt process, of course, as the underground development commenced as early as 1978, with the shaft being commissioned in 1982. As of 2016, the average annual production stands at around 1.5 million carats, though the company intends to raise it to 2 million by the end of 2017. The Jwaneng Diamond Mine is believed to be one of the, if not the single richest diamond mine anywhere in the world. This is, of course, going by the value the diamonds fetch due to their quality and effective methods of extraction rather than sheer volume of the deposits. It is relatively young when it comes to diamond mines, having been discovered in 1972, and not becoming fully operational until a decade later, in 1982. Presently, the mine is owned and operated by Debswana, which is in turn jointly owned by the De Beers Company and the Government of Botswana, where the mine is situated. It is interesting to note that Jwaneng is Setswana for “a place of small stones”. Much like other mines in the general area, the Jwaneng Mine recovers its diamonds from a kimberlite pipe, or, rather, three separate kimberlitic intrusions that converge before surfacing (south, north and centre, plus a couple of minor bodies). The total area of the site near the surface is around 52 hectares, which is rather considerable in all respects. In total, and given the rate of extraction, it is estimated that the mine will be operational for almost three decades before exhausting its reserves. Speaking of reserves, the Jwaneng Mine is adjacent to the Jwana Game Park, and the two fall under the same lease area. The park, along with the Orapa Game Park, aims to (and ostensibly succeeds) in painting diamond mines and mining companies not as threatening to the environment as the traditional conception would have it, but rather as capable and willing to manage and protect the wildlife. While the Jwaneng Mine is the most prominent mine by value, the Orapa Diamond Mine (or “the resting place of lions” in Sesarwa) is the most prominent diamond mine when taking the sheer size into account. The Orapa Mine spreads over 118 hectares at surface level. As the name might imply, the mine is situated in the town of Orapa, in Botswana’s Central District (scarce 30 kilometres northwest from Letlhakane, which is the site of another major kimberlitic intrusion). Much like its sister mine, the Orapa sources its stones from a kimberlitic pipe, but rather than have three intrusions converging near the surface, the Orapa has two. Still, as noted above, it remains the world’s largest open pit diamond mine. The ownership of the site is claimed by Debswana, which is a joint venture of the Government of Botswana and the De Beers company (hence the name). The site was identified as early as 1967, becoming fully operational in 1971, and has been in operation pretty much its entire existence, even doubling the capacities in 1999. Interesting to note, the mine has tallied over 2 million shifts without fatalities. As of this date, the average production at the Orapa mine is around 11, at times even 12 million carats per year. The number includes ore processed not only from the Orapa mine, but also two other nearby mines owned by Debswana, those being the Damtshaa and the aforementioned Lethlakane. No notable diamonds have been unearthed at the mine. The Jubilee Diamond mine is an open pit mine that is located in the Republic of Sakha, in the Russian Far East. More specifically, the mine is situated scarce 12 kilometres northwest of Aykhal and some 70 kilometres from the town of Udachny. All three localities are home to kimberlitic intrusions, though the Jubilee mine (also known as the Yubileinaya) is the more prolific, being ranked the second most productive mine in 2016. 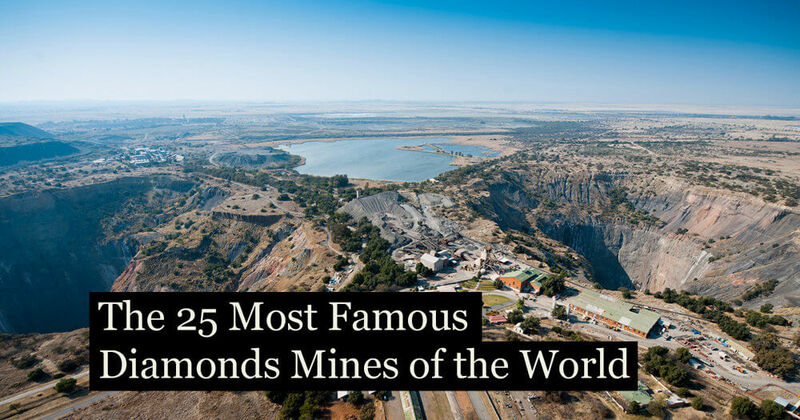 Speaking of rankings, it is also one of the largest diamond mines in the world by area alone. The Jubilee is a relatively young mine, having become fully operational in 1989. It was established by ALROSA, which still runs the operations. As of this date, the mine is active at the depth of over 300 metres, though it is expected that the maximal depth would be over 700 before the reserves are depleted. The mine has consistently ranked among top ten mines in regards to production in recent years, averaging 10 million carats per year. There are no notable diamonds to speak of. The Snap Lake Diamond Mine is probably the most inaccessible diamond mine in the world, even considering the plethora of mines in Yakutia (the Russian Far East). The mine itself is located over 200 kilometres northeast of Yellowknife, in Canada’s Northwest Territories. The mine is approachable by two ways – either via an ice winter road or by a private airport that is strictly reserved for carrying cargo and passengers that go to and from the mine. Speaking of the latter, the mine used staffed by 400 people at any given time (with the total number of employees being almost double that). The mine is owned and run by the De Beers Company, and it was, in the company’s own words, their first operation outside of the African continent. Snap Lake claims another first, as it is the first diamond mine in Canada that is fully underground. It is a fairly young operation, at that, with the construction having begun in 2005, and the mine becoming fully operational in 2008. The expected lifespan, according to the estimated reserves in the kimberlitic intrusion, should be 15 years. Interestingly enough, the deposit is unlike other kimberlitic intrusions, in that it lacks the characteristic conical shape. In 2014, it produced 1.2 million carats worth of diamonds. However, in 2015, due to decreased prices of diamonds and the costs of production remaining the same (not to mention costly licenses), De Beers announced they would be suspending the activities and putting the mine under “care and maintenance”. In accordance, they flooded the mine in December of 2015, with only 70 hands on site to maintain the facilities. The Victor Diamond Mine is a sister mine to the Snap Lake Diamond Mine, and it is the second mine De Beers established in Canada (after the aforementioned Snap Lake). It is situated in Ontario, in the far-flung northern area of the province (some 90 kilometres due west from the Attawapiskat Nation). Unlike its sister mine, which is completely underground, the Victor Diamond mine is an open pit operation, with all the required facilities to process the ore, as well as an airstrip to move cargo and personnel. The airstrip is accessible from the mine via a gravel road, and remains the only viable access route to the remote mine. This mine is another “new kid on the block”, so to speak, in the world of diamond mines. Construction began in early 2006 (not even a year following Snap Lake), employing as many as 3,200 people during this stage. Commercial production began in early 2008, with the official opening taking place in July the same year. At the height of operations, the mine employed 350 people, plus around 150 contractors. Sourcing the stones from a kimberlitic pipe, the mine averages some 600,000 carats each year. However, in echo of what happened to its sister mine, the De Beers Company decided keeping Victor in life is no longer profitable (a combination of the falling price of diamonds, operating costs and licencing fees). Consequently, they have announced the company will be terminating all the activities in the mine by the end of 2019. The Gahcho Diamond Mine, also known as the Gahcho Kué Mine (“Place where big rabbits are found” in Chipewyan), is a diamond mine owned and run jointly by the De Beers Company, who is the majority shareholder (51 per cent), and Mountain Province Diamond Inc. (holding 49 per cent). The mine is situated in the remote northern part of Canada’s Northwest Territories, on the shores of Lake Kennady, some 280 kilometres going northeast from Yellowknife. It’s also some 80 kilometres due southeast of the Snap Lake Diamond Mine. It is De Beer’s third diamond mine in Canada, after Snap Lake (2005) and Victor (2006). Diamonds were confirmed in the area in 1999 (surveying the area started six years prior), but the mine development did not begin in earnest until 2005, and the official opening took place as recently as late 2016. The mine recovers its stones from three kimberlitic intrusions (5034, Hearne and Tuzo), and covers a total surface area of about 1,200 hectares. That said, surveyors discovered four deposits, but only three of them contained diamonds. To mine these, the water level had to be lowered. The expected lifespan of the mine, based on the initial estimates, should be 12 years. Given that commercial production began quite recently, Gahcho Kué still has a decade or so to go. Speaking of production, so far about 4.5 million carats have been recovered from the 5034. It is important to note that, much like its sister mines, the Snap Lake and Victor, the Gahcho Kué is only accessible by air (or a treacherous ice road, only in service during winter). To the uninitiated, the Venetia Diamond Mine might sound like it is located in Italy, or a part of Europe, at the very least. However, the mine is actually situated in South Africa’s Limpopo Province, some 35 kilometres of the town of Alldays, and about forty kilometres from the tripoint of South Africa, Zimbabwe and Botswana. The mine is one of three remaining mines De Beers operate in South Africa, the other two being Voorspoed and Kimberley (though the company is present in the latter only through subsidiaries; the rights and the mine itself are owned by Ekapa Minerals). As for Venetia itself, it is an open pit mine where the stones are sourced from a diamantiferous kimberlitic pipe, as per usual. The reserves are estimated at staggering 94 million carats, which, at the current rate of extraction, should keep the operations running until 2046. In a manner of speaking, the Venetia mine could be considered De Beers’ flagship in South Africa, and the money they invest speaks volumes to that effect. The company plans to further develop the operations by concentrating on underground mining. The project is expected to finish by 2022, with commercial production reaching peak in 2025. According to the company’s numbers, this has already created well over a thousand jobs, with 2,000 as the end goal. Moreover, accommodations for workers are being constructed in the nearby town of Musina, as per project. It is interesting to note that, despite being over a quarter of a century old, the mine has not yet yielded an exceptional diamond. The Diavik Diamond Mine is located in the most populous region of Canada’s Northwest Territories, the North Slave Region. It lies on the shores of Lac de Gras, some 300 kilometres northeast of Yellowknife (it is closer to the Arctic Circle than the Territories’ capital by almost a hundred kilometres). The Diavik is considered the premier mine in the region, employing about a thousand people, with annual production of around 7 million carats. The mine is jointly owned by the Rio Tinto Group (who is the majority shareholder) and the Dominion Diamond Corporation. The Diavik sources its diamonds from four kimberlitic intrusions. Of course, much like the rest of the mines in the region, Diavik is solely accessible by aeroplane or via an ice road (the latter is the preferred route for transport of supplies and spare parts, and is heavily relied on; so much so, that a late freeze and early thaw in 2006 caused production costs to spike as supplies had to be brought in by plane). That said, the mine has a rather accommodating airstrip, with enough room for a Boeing 737. The mine is also noted for having the first large-scale wind park in the Territories, which supplies a tenth of the mine’s needs (thereby offsetting the diesel consumption by 5 million litres yearly). As for the timeline, the area was surveyed as early as 1992, and confirmed to contain diamantiferous bodies. Construction began nine years later, taking mere two years to complete. As of yet, there is one noteworthy diamond unearthed in the mine – the Diavik Foxfire weighs in at 187.7 carats, and is the largest gem-quality diamond found in North America. The Ekati Diamond Mine is an underground and open pit diamond mine located in Canada’s Northwest Territories, almost 300 kilometres northeast of Yellowknife, and scarce 30-odd kilometres from another major diamond mine in the region – the Diavik. That said, the two mines are not connected by any road except the winter road. The Dominion Diamond Corporation has shares in both these mines, being the majority shareholder in the former (80 per cent) and a minority shareholder in the latter (40 per cent). The remaining 20 per cent of the shares of the Ekati Mine are divided equally between the two geologists that discovered the site in the first place – Stewart Blusson and Chuck Fipke. The two geologists had discovered indications of kimberlite intrusions in the region as early as 1985, with the Point Lake being the first confirmed diamantiferous intrusion. At the time, mining the pipe was not considered economically viable, but it did trigger a modern “diamond rush”, resulting in almost the entire area between Yellowknife and the coast being staked. On that note, it should be stressed that Ekati has the honour of being the first diamond mine in Canada. Since then, several more kimberlite pipes have been identified at the site – Jay (1993), Sable (1995) and Misery. The official start of operations at the Ekati mine came in 1998, beginning with the Point Lake pipe, and then Jay and Sable following suit. The recovery from Misery is expected to start in 2020, upon completion of the open-pit operations. There are two other deposits, one underground and one open-pit, those being the Koala and Fox Pit, respectively. It is interesting to note that a certain number of diamonds have no place of origin. In some cases, these are very old diamonds whose provenance has been lost in the mists of time. In other cases, the diamonds have been re-cut from other, older and storied stones, in an effort to hide their true heritage, and in yet other cases, we are likely looking at blood diamonds (though few are willing to make the connection once the stone has been “grandfathered in”, so to speak). It would be remiss to speak of diamonds and diamond mines without acknowledging such cases of “orphaned stones”, such as the Edcora Red or the Raven Diamond, whose origin stories are a complete mystery. Another such stone is the Skull Star Diamond, though given its pink hue and the fact that the Argyle Mine accounts for the great majority of pink diamonds, we are fairly secure in making the connection. Still, no studies have provided definitive evidence. Of the Spoonmaker’s diamond we can say that it resides in Turkey, but whence it came is unknown. Such is the case with the Star of the East, though educated guesses place its mine of origin in India, given the name and physical properties. Another star, the Star of the Season, is also a hotly debated matter, though guesstimates based on physical properties place it in South Africa. Two similar stories tell of the Stuart or Holland Diamond, an old and storied stone that at one time belonged to Dutch royalty, and the Sweet Josephine Diamond, a pink beauty of a stone of unknown provenance and whereabouts.